Tuesday, Nov. 27 - We put in a few miles riding to the following meetings, despite a light rain. Dunn Loring Metro Station sidewalk meeting - On Tuesday morning we met with several staff from WMATA at the station to discuss the temporary sidewalk leading into the property from the paved trail along Gallows Rd on the north. The new sidewalk is narrow and splits, with a wide lip that could, and did, catch a wheel and caused a crash. These "temporary" sidewalks will be in place for at least two years. We were told that some additional paving would be done to make the situation safer for pedestrians and cyclists. Tysons Bike Group meeting - Glenn Hiner of Fairfax Co Employer Services brought copies of the microfiber bike map of Tysons that he is using to promote bicycling in Tysons with the goal of reducing congestion. 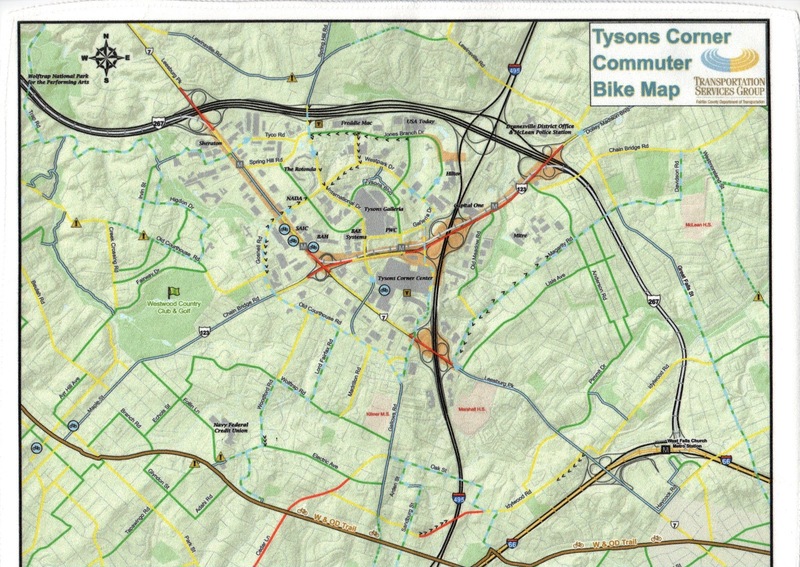 The map shows bicycling conditions in and around Tysons. A similar map is planned fro the area in Reston around the Wiehle Ave Metro station. Glenn also discussed the possibility of the county subsidizing small-scale, employer-based bike sharing in Tysons, similar to Patriot Bikeshare. We discussed the many funded bike projects in the Tysons area including bike lanes on Idylwood Rd between Helena and Idyl Lane, paved shoulders on Old Courthouse Rd at Freedom Hill Park, upgrading the Ashgrove Lane trail, building a new trail from Vesper Ct to the Tysons West Metro station, and sharrows and wayfinding signage in various locations. 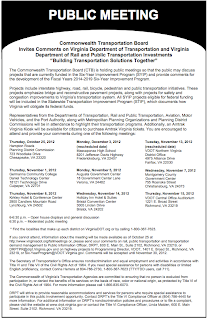 Tysons Stakeholder meeting - Updates on various transportation projects around Tysons. As development occurs in Tysons, developers are being requested to contribute to a Tysons-wide transportation fund to be used for trip reduction strategies, probably managed by the Tysons Partnership. Bicycling will play a role in those strategies. 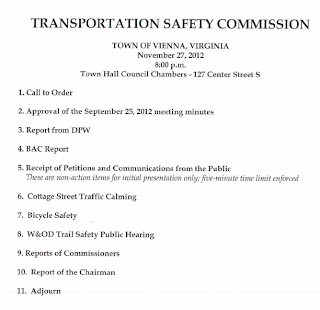 W&OD Trail Safety meeting - The Vienna Transportation Advisory Commission held a public hearing that evening on W&OD Trail safety. It was an unusual public hearing since there was no public information on which to base comments. We're well aware of many concerns expressed by some trail users regarding bad behavior, but there was no clear definition of the problems nor any proposed solutions provided beforehand. We suggested that a TSC subcommittee meet with reps from the various user groups to discuss the perceived problems and to develop suggestions. At the end of the meeting Bob McCahill, Vienna Bicycle Advisory Committee chair, presented a list of proposed safety measures. The Town Council plans to meet with reps from the Northern Virginia Regional Park Authority at a work session on Dec. 10 at 8pm to discuss the issue. Wednesday, Nov. 28 - It was a cold but clear riding day with a very bright full moon that evening. Alternative Transportation event at Defense Health Headquarters - DHHQ is located just inside the Beltway on Route 50. There are no safe bike/ped crossings of the Beltway on Rt 50 and only the most experienced cyclists will try to right through the intersection. However, there are many good routes from the north, east, and south. We had a table at the mid-day event and spoke to a few of the 3,000 employees working in the building. Route 7 Public Citizen Information Meeting - VDOT now holds public meetings much earlier in the planning process than they did in the past. At this evening meeting information was provided regarding plans to widen Route 7 to 6 lanes between Reston Parkway and Jarrett Valley Dr. There will be multi-use trails on each side of the road. We asked about the possibility of dedicating a lane to transit service. The next citizen information meeting is scheduled for Fall of 2013 at the end of the preliminary design phase. Transportation Planning Board Community Leadership Training - This training is provided for free by Metropolitan Washington Council of Governments (MWCOG). 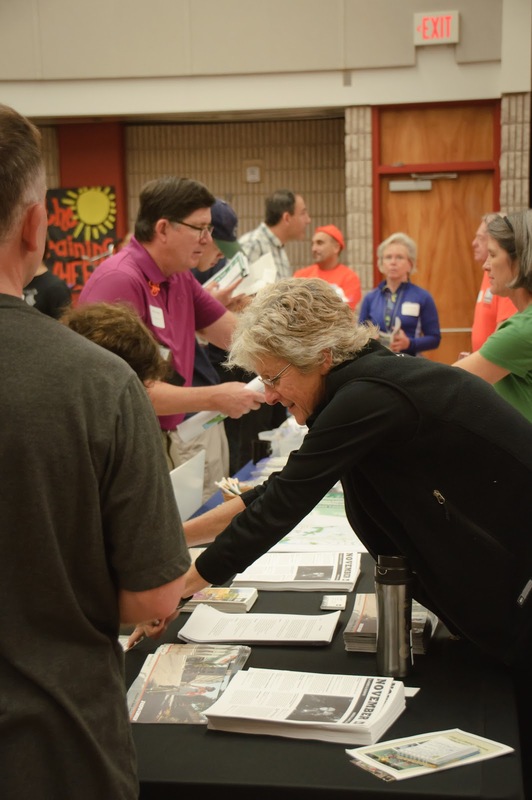 This is a "workshop designed to help community activists learn how to get involved more effectively in transportation decision-making in the Washington Region." The major part of the training takes place on Saturday. The sessions have received good reviews from other who have taken them in the past. The trip to the training was multimodal: bike to bus, bus to rail, rail to DC, Capital Bikeshare to the MWCOG offices. Historic Marker Bike Tour - We plan to meet with a cyclist interested in helping us put together a bike tour that would visit several of the historic markers located throughout the county. It would be a great way to explore the rich history of Fairfax. Accidents between vehicles and bicycles in Fairfax County are happening more frequently this year. There have been 54 collisions between vehicles and bicycles this year with one fatality, up from 44 accidents between bicyclists and vehicles with no fatalities in 2011. On Nov. 12, Elizabeth P. Shattuck, 58, of Falls Church, was hit by a pickup truck. Police pronounced her dead at the scene, marking the first Fairfax County death resulting from a bicycle-versus-vehicle collision in two years. The incident is still under investigation, and charges have yet to be filed. Greg Billing, a spokesman for the Washington Area Bicyclist Association, said there are an increasing number of people taking to the roads on bicycles across the region. Update: See the ABC7 report on increased crashes in Fairfax. Floyd Alveraz of Spokes, Etc. in Vienna was interviewed. He sums up the situation well: "We're all trying to get somewhere and we all have different ways to get there, but we all need to share the road." City Cycling and Everyday Bicycling: How to Ride a Bike for Transportation are new books that would make great holiday gifts. 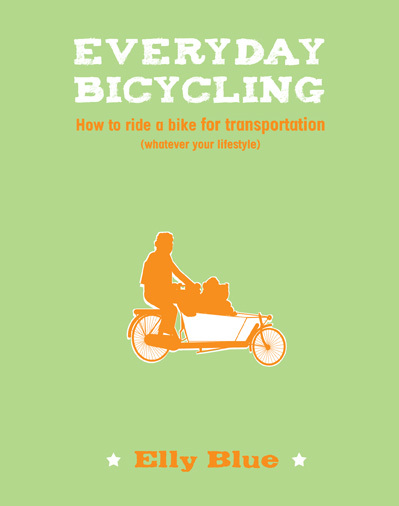 Everyday Bicycling is a great book for someone just starting to use a bicycle for transportation. Author Elly Blue "introduces you to the basics, including street smarts, bike shopping, dressing professionally, carrying everything from groceries to children to furniture, and riding in all weather. With its positive, practical approach, this book is perfect for anyone who has ever dreamed of riding a bicycle for transportation." Elly writes Taking the Lane, "Books and ideas for you and your bicycle." City Cycling documents the growth of cycling in cities around the world. Co-author John Pucher, a professor at Rutgers, has written extensively on what it takes to make bicycling a viable transportation option. The other co-author Ralph Beuhler is Assistant Professor, Urban Affairs & Planning at Virginia Tech's Alexandria Center. He recently wrote about bicycling in the DC area: Determinants of bicycle commuting in the Washington, DC region: The role of bicycle parking, cyclist showers, and free car parking at work. Bicycling in cities is booming, for many reasons: health and environmental benefits, time and cost savings, more and better bike lanes and paths, innovative bike sharing programs, and the sheer fun of riding. City Cycling offers a guide to this urban cycling renaissance, with the goal of promoting cycling as sustainable urban transportation available to everyone. It reports on cycling trends and policies in cities in North America, Europe, and Australia, and offers information on such topics as cycling safety, cycling infrastructure provisions including bikeways and bike parking, the wide range of bike designs and bike equipment, integration of cycling with public transportation, and promoting cycling for women and children. City Cycling emphasizes that bicycling should not be limited to those who are highly trained, extremely fit, and daring enough to battle traffic on busy roads. The chapters describe ways to make city cycling feasible, convenient, and safe for commutes to work and school, shopping trips, visits, and other daily transportation needs. The book also offers detailed examinations and illustrations of cycling conditions in different urban environments: small cities (including Davis, California, and Delft, the Netherlands), large cities (including Sydney, Chicago, Toronto and Berlin), and “megacities” (London, New York, Paris, and Tokyo). These chapters offer a closer look at how cities both with and without historical cycling cultures have developed cycling programs over time. The book makes clear that successful promotion of city cycling depends on coordinating infrastructure, programs, and government policies. People like Branyan and Elizabeth MacGregor, 49, who has a 28-mile round trip between her Vienna home and downtown D.C. office, have to dress for the cold weather. "If I were advising somebody who was just starting out, I’d say, see what you’ve got in your closet and try to use that,” said MacGregor, who began commuting by bike about eight years ago. “You don’t have to spend a lot of money on this. I wear a merino wool base layer. I wear ski sweaters, usually. I have a variety of weights, and then either a cycling jersey or a fleece vest or a wool vest. And then I wear a wind-breaking layer on top. And I have tights that I wear, too." In the wintertime, she abandons her bike shoes, which clip onto the pedals, and screws on a pair of platform pedals so she can wear warm "street boots." "I wear either a wool cap and a buff around my neck, or I wear a balaclava, like I did today," she said on a morning when the temperature was in the mid-30s. "I have thick fleece gloves." MacGregor said she embraced the bike commute after "a couple of bad days on the Red Line." "My son was young, and I wasn't getting a lot of chance to exercise. 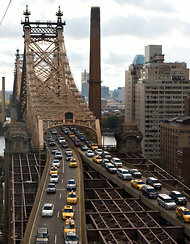 So I thought if I combine the commute with the exercise, that will be a way for me stay in shape," she said. 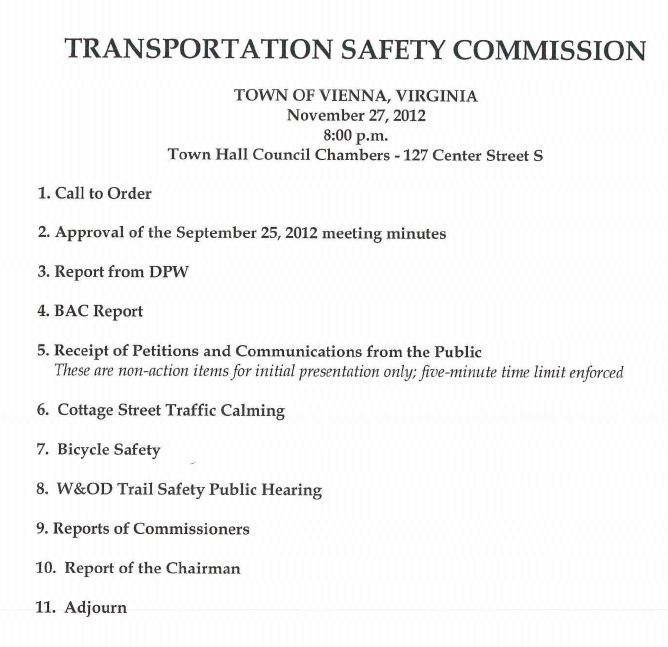 The Vienna Transportation Safety Commission will hold a public hearing on W&OD Trail safety. According to signs like the one on the right that are posted along the trail in the Vienna area, the meeting will start at 8pm, Tuesday the 27th at the Vienna Town Hall, 127 Center St. The text on the signs reads: "W&OD bike trail safety solution - cyclist pedestrians: All interested individuals are invited to attend." See our notes about an earlier W&OD Trail safety meeting held in Vienna. Many ideas have been proposed, many of which are not enforceable. Probably the best idea is for everyone to be courteous and respectful. If you have constructive ideas about W&OD Trail safety, consider attending the meeting. Update: The agenda for the TSC meeting has been posted on the Town website. The Fairfax County Bicycle Master Plan was recently completed by Toole Design Group. During the planning process Toole hosted the bike plan website. Now that the final draft plan has been submitted by Toole, the project site is no longer active. The county has not yet posted the information on their servers. The link to the project site on the County's Countywide Bicycle Master Plan page no longer works. Fortunately most of the information is now located on Fairfaxpedia, a "collaborative encyclopedia for the Fairfax community in Northern Virginia." 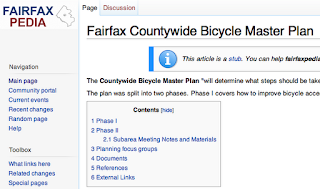 Fairfax Countywide Bicycle Master Plan - Fairfaxpedia contains a majority of the information from the Toole website, including notes from the subarea and focus group meetings. While it's great that this information is now available, the County should have a copy of the full Toole project data online, especially since the bike plan is still in draft form and has not yet been presented to the Planning Commission or Board of Supervisors. Thanks to Frank Muraca, Deputy News Editor at Connect2Mason, for transferring the data to Fairfaxpedia. Connect2Mason is an online news site at George Mason University. 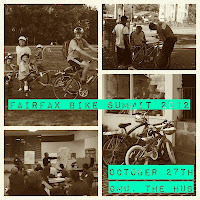 Frank attended the Fairfax Bike Summit and wrote a good summary, Inaugural community bike summit held at Mason. After the summit he asked about the status of the Toole site. A notice on the site said it was being deactivated in the near future. Frank took the initiative to make sure the information is available until the county can take it over. This morning we joined a social ride sponsored by the Reston Association Pedestrian & Bicycling Advisory Committee. Burton Griffith of the PBAC led the short, 7-mile ride through north Reston neighborhoods. Also along were Nicole Wynands of the PBAC, Kerie Hitt of FABB, and a family from the Fairfax City area. While we were waiting to start another rider stopped by to say hi. He was with a group of neighbors and their kids who do an annual Thanksgiving Day ride from the South Lakes area. Thanksgiving rides have become somewhat of a tradition in this area. bikes@vienna has been holding their Guilt Reduction ride for many years. Riders bring canned food to donate to the CHO Food Drive. It's a great way to start your day before feasting on all the holiday treats. Happy Thanksgiving! Today FABB placed a ghost bike near the intersection of Ashwood Place and Columbia Pike. Elizabeth Shattuck was killed when she was hit by a motorist driving a pickup truck. The motorist was headed westbound. 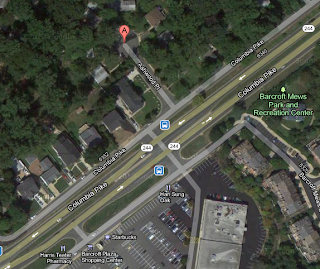 Elizabeth was likely crossing Columbia Pike to reach Barcroft Plaza Shopping Center. At this location Colubmia Pike is a high speed arterial with no bike facilities. There are service roads on either side of the main road but at this intersection there is no crosswalk or traffic control device to assist anyone trying to cross the Pike to reach the shopping center. The speed limit appears to be 45 mph. The crash occurred at around 2pm. Sight distance should not have been a problem, and the motorist should have been able to see the cyclist. Since police are seeking eyewitnesses, there were likely no witnesses at the scene. The motorist has not been charged. This is the first bicycle fatality in Fairfax County this year. Elizabeth is memorialized at the website Every Bicyclist Counts, which was established in May of this year by the League of American Bicyclists. For more information on Every Bicyclist Counts see the LAB blog. Our condolences go out to Elizabeth's family. We mentioned earlier that there will be a secure bike parking room at the new development (Reston Station) underway at the Wiehle Ave Metro station. There will be room for 240 bikes in the parking garage, with more visitor parking scattered around the site. All of this is located on the north side of the station. 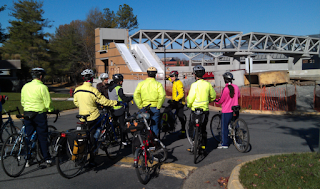 During the FABB Social Ride in Reston we visited the south side of the station. Many of us were wondering whether there would be bike parking on that side. I have been involved in the planning of this station for many years as part of the Wiehle Avenue Steering Committee back in 2004 and as a member of the Reston Metro Access Group. Most of the focus of those meetings was on the public private partnership development on the north side. We were also very concerned about proper access on the south side. Originally the only access was a long walkway parallel to the Dulles Toll Road exit ramp leading to Wiehle Ave. It was never clear whether any bicycle parking was planned on the south side. We've confirmed with county staff that there will be a direct pedestrian entrance from the south side parking area to allow tenants of the existing office buildings to access the station. 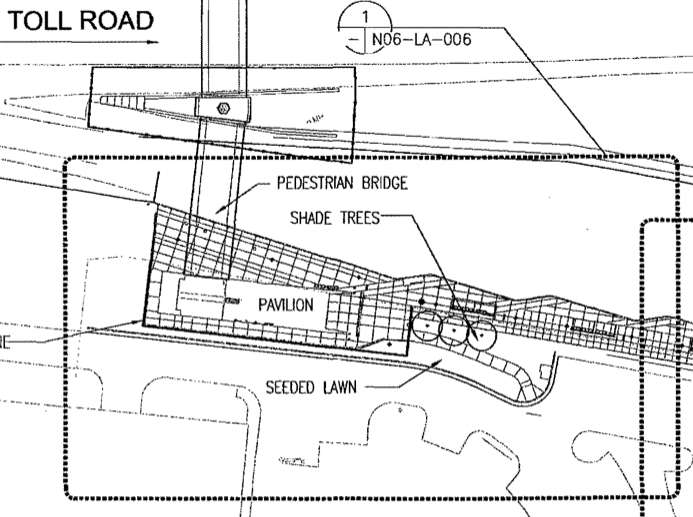 You can see the pedestrian/bike entrance leading to/from the curb in the image below (just above and to the right of the "seeded lawn" area. There will also be space for 10 bicycles on this side. That will likely need to expand over time. There may also be bike lockers but that's not confirmed. A major mixed use development is under construction at the Dunn Loring Metro station site. The surface parking lot is being replaced with residential high rise buildings, retail space, and structured parking for Metro customers, residents and retail customers. Bicycle access to the site from the north is via the bike lanes on Gallows Road that turn into a multi-use trail on the west side, or by using Gallows Road itself. Unfortunately the trail on the south side of the I-66 bridge was recently replaced by two narrow sidewalks that split. One leads to the bus stop and the other leads to the station entrance. The photo on the right, looking north toward the Gallows Road bridge over I-66, shows the split in the trial. It also shows ponding of water that metro customers must to wade through after a heavy rain. When we first visited the site we made the mistake of trying to ride from one sidewalk to the next. There's a lip on the sidewalk edges that caught my front wheel and I took a slow-speed tumble. We've reported these conditions to the folks at WMATA who were very responsive. They said this is a temporary situation, that eventually there will be a wide sidewalk replacing the two narrow sidewalks. They also said that a clogged drain has been fixed so that water no longer ponds here. We're planning to meet next week with WMATA staff and the developer to see what can be done about the narrow sidewalks. 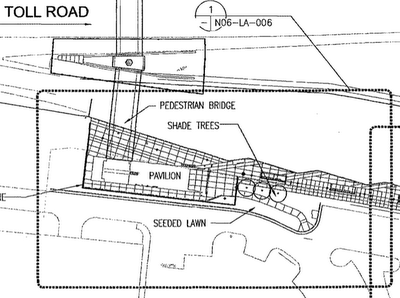 I'll likely suggest that the triangular section between the sidewalks be filled with concrete to create a wide sidewalk. Called Arbor Row, this project is the second major redevelopment plan for Tysons to get the green light. Earlier this fall, the board approved Capital One Bank’s mixed use expansion at its current campus. To date, Fairfax County has given the go-ahead for more than 14-million square feet in new major development in Tysons, which is expected to grow to 113 million square feet by 2050. Cityline will construct eight new buildings on a 19.4-acre site along the south side of West Park Drive near Tysons Galleria. The plans call for three high-rise residential buildings with up to 1,179 units in total, four office towers, more than 58,000 square feet of retail and an approximately 250-room hotel. Construction could begin on some parts of this six-block development soon since CityLine’s application includes final development plans. Arbor Row will be walking distance from the future Tysons Corner Metro station. Of the entire project, about 28 percent will be 1/4 to 1/3 mile from this station, and 70 percent will be between 1/3 and 1/2 mile from Metro. This development and the Georgelas mixed use development (which was discussed at the Bike Summit) are both setting the stage for Tysons to become a bike-friendly place. It will take many years for the transformation to occur, but these early developments are an indication that bicycling is being treated as a legitimate transportation mode in Tysons. We've added some photos from the Fairfax Bike Summit to the FABB Flickr pool. The photos were taken by Sue Carter. 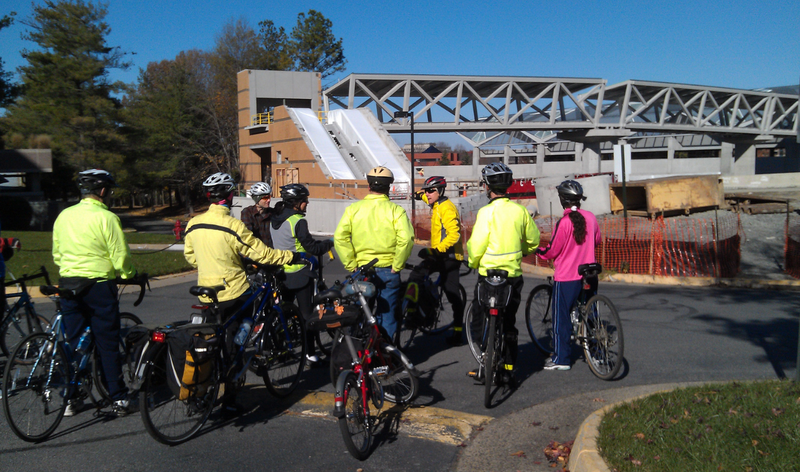 We had a good turnout for the Reston tour today, one of a series of FABB social rides. It was in the low 40's when we started at the Reston Town Center but the sun was out and it got much warmer during the ride. We checked out the new Wiehle Ave Metro station under construction, pondering how users will be able to access the station from the south side and where bicyclists will park their bikes on that side. On the north side there will be 240 spaces, many of them in a secure bike room that includes a Fix-it station, that is part of the Comstock development Reston Station. We discussed the Monkey House scare in which imported monkeys living in lab near Newton Square in Reston were thought to have contracted the Eblola virus. The best-selling book The Hot Zone is a fascinating account of that episode. We stopped at Old Reston Ave and discussed the early attempt to establish the town of Wiehle. The site is where the Bowman Distillery was located. The whiskey Virginia Gentleman was made there up until 1986. The photo on the right shows W&OD Trail users passing the distillery. We then rode to historic Lake Anne Village Center and eventually made our way back to the Reston Town Center. Afterwards a few of us had lunch at Vapiano. Check out the Reston Museum Virtual Tour page for links to other interesting historic photos. We hope to hold more rides next year. For more information about our rides, including cue sheets for previous rides, visit the FABB Social Rides page. It will be a cold start to our FABB Social Ride, a tour of Reston, on Saturday morning, but it should be a beautiful day. The high temperature is predicted to be 50 degrees. There is still room for a few more participants on this free 14 mile ride. We'll ride along the bike lanes on Lawyers Road and Soapstone Drive that were created by reducing 4 lanes to 2 lanes with bike lanes. We'll also check out the new Wiehle Ave Metro station and discuss the planned bike room with parking for over 200 bicycles. Then we'll ride a short stretch of the W&OD Trail to the Bowman Mansion, site of the original first settlement in the Reston area. Then it's on to historic Lake Anne Village Center, Browns Chapel, then back to the Reston Town Center where the ride starts and ends. There is an option for a shorter, 10-mile ride. Loudoun County, VA- Loudoun County Sheriff Michael L. Chapman, county leaders, and community advocates will join together tomorrow to announce the Street Smart pedestrian and bicycle safety campaign. Sheriff Chapman will be reminding motorists to obey traffic safety laws whether you are a pedestrian, cyclist or driver. To curb pedestrian or cyclist injuries and fatalities in the region, Street Smart will kick off its fall safety campaign on Wednesday morning at the intersection of Belmont Ridge Road (Route 659) and the W&OD Trail in Ashburn, VA. Residents will be reminded to remain alert, share the road and obey traffic laws. As part of the campaign, the Loudoun County Sheriff’s Office and law enforcement in the Metropolitan region will be out in force through November 25, ticketing motorists, pedestrians and bicyclists who don’t follow area traffic safety laws. The press conference will be held Wednesday, November 14, 2012, at 11AM at the intersection of Belmont Ridge Road (Route 659) and the Washington and Old Dominion Trail. Any cyclists who receive a ticket at this or other W&OD intersections should find out what Virginia code was used for the offense. If it's "§ 46.2-821. Vehicles before entering certain highways shall stop or yield right-of-way," at least one judge has dismissed a ticket where that code was cited because the trail is not a highway. Fairfax County police are investigating a crash that left a female cyclist dead on Monday in Falls Church near the intersection of Columbia Pike and Ashwood Place. Elizabeth P. Shattuck, 58, of Falls Church, was pronounced dead at the scene when the bicycle she was on was hit by a 1998 Chevrolet S-10 pickup truck while she was attempting to cross Columbia Pike from the north to the south around 2 p.m., police said. As the truck traveled westbound on Ashwood Place, Shattuck was hit as she crossed the westbound lanes. Police said she hit the hood and went over the roof. Police do not believe the 72-year-old man who was driving the pickup was speeding or under the influence of anything. Join FABB for a casual tour of various sights in Reston on Saturday, November 17 at 9am. The tour will start at the Reston Town Center Pavilion. Sights include bike lanes on Lawyers Road and Soapstone Drive, Walker Nature Center, Wiehle Ave Metro Station, Bowman House, historic Lake Anne, and Browns Chapel. We will ride at a slow pace as a group. The tour is just over 14 miles with a shorter option of approximately 10 miles. Free online registration is required. All riders must be WABA members, wear a helmet, and sign the ride waiver. * The ride is for adult WABA Members. Children 14-18 may participate if they are accompanied by an adult WABA member. The public is invited to a Commonwealth Transportation Board (CTB) public hearing on "projects that are currently funded in the Six-Year Improvement Program (SYIP) and provide comments for the development of the Fiscal Years 2014-2019 Six-Year Improvement Program. Projects include interstate highway, road, rail, bicycle, pedestrian and public transportation initiatives." This is an opportunity to let the CTB know that bicycling is an important part of Virginia's transportation system. Accommodations for bicyclists should be included in all VDOT projects. When new projects are planned, they should not make conditions worse for bicyclists. VDOT has a policy for integration bicycle and pedestrian accommodations. Most new road projects in Fairfax include some bicycle accommodations. However, most large road projects have a negative impact on bicycling and walking. 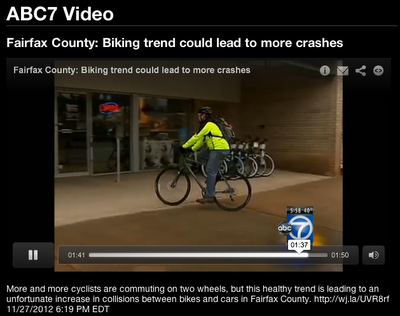 It's important that cyclists speak out in favor of creating a bicycle-friendly Fairfax. See the Six Year Improvement Program database to find projects in Fairfax. On that same night is the Transit Network Study public meeting in Vienna. A second meeting is scheduled for Thursday in Springfield. Just wanted to let you know that I had my day in court today. While I was ready to plead my case to the judge, I was told by the officer that I can speak with the Commonwealth Attorney present before the hearing begins. Was I glad that I did. There was a long line so it took a bit before it was my turn. I told her that I was ticketed for rolling through a stop sign on the bike trail on my bike, she paused for a bit, and asked was I aware that there was a stop sign. I told her yes, and not stopping was a bad judgement on my part. But I also explained to her that my past experiences with these intersections and the confusing predicament that I often found myself in can make it difficult to obey the posted sign when it comes to my own safety. She then asked for the ticketing officer to explain what he saw, and his stance was simply that I failed to obey posted sign. It was what she asked next that I found to be quite interesting. She asked the officer whether or not this intersection was a city street crossing another city street or a crosswalk crossing a city street. At first, the officer didn't seem to understand her, and was trying to say that it was a busy intersection. She repeated the same question again, and he just seemed to be unwilling to acknowledge the fact that the intersection was a crosswalk to street rather than street to street. I ended up chiming in and stated that the intersection was a pedestrian/cyclist crosswalk crossing a city street. At that point, she made a comment along the line of "I think I see what's going on here", told me that she felt that I know what I did was wrong, and will be more cautious in the future. In the end, she gave me the "benefit of the doubt" and will recommend to the judge that the charge be dropped. That is precisely what the judge did! We attended the court session in Vienna on Monday, November 5 to hear the case against a motorist, John Thorpe, who was alleged to have intentionally struck a cyclist. That case was once again postponed until January 7 because the cyclist was not present. Mr. Thorpe and three witnesses were there and they agreed to return. Before that case was heard there were many, many cases involving motorist infractions. Only the most blatant offenders ever get to traffic court. Police don't write speeding tickets unless motorists are going 10mph or more over the limit. For a DUI your blood alcohol level must be 0.08% or greater. For a 160 lb adult, that level is equivalent to drinking between 5-6 beers in 2 hours. It was a little depressing to see so many motorists treated very lightly for speeding and being convicted of DUI. Several of the speeding tickets were changed to "Failure to pay full time and attention," a Town of Vienna charge which is bacically a slap on the wrist that does not result in points on one's drivers license. One motorist was charged with speeding. He had +1 points on his license and the judge said he had a "good record" and he changed the charges to "Failure to pay full time and attention". According to VA DMV, "For every full calendar year that you hold a valid Virginia license and have no violations or suspensions, you get one safe driving point. You can earn up to five of them and use them to offset your demerit points." In my opinion, an adult with only +1 points does not have a good driving record. Virginia is tough on drunk drivers, and with good reason. One out of every 10 Americans will be involved in an alcohol-related crash during their lives. Alcohol-related injuries occur about every two minutes, and fatalities occur every 32 minutes, on average. That is why it's important to know the facts about driving under the influence of alcohol or drugs, and to avoid this behavior entirely. If you've never had a DUI, you might not realize that it's not a traffic violation―it's a criminal offense. You'll be handcuffed, carted off to the police station, and required to go to court. These motorists are the real scofflaws. They endanger lives and are the worst of the worst and yet they are treated very lightly. As a society we've become insensitive to the damage being done by these drunk and aggressive drivers. It's sad to see the court treat them so lightly. These are some of the words people who attended our first Fairfax Bicycle Summit used during and after the October 27 event. FABB collaborated with Fairfax County Department of Transportation (FCDOT) and George Mason University to put together a stellar list of speakers and local bike shops, who inspired us to redouble our efforts to make bicycling an everyday activity for the good of our communities. We heard of at least two people who visited local bike shops after the summit, looking for bikes to use for local trips. Keynote speaker Andy Clarke, President of the League of American Bicyclists, stated the obvious: Fairfax faces many challenges for bicyclists. But he also noted that things are changing for the better. Fixing some of the challenges does not necessarily involve any grandiose ideas, specialized infrastructure, or millions of dollars. For example, simple actions such as closing gaps in our sidewalks and trails and keeping walking and bicycling paths clear of snow and debris would improve conditions for bicyclists. Although encouraging bicycling is not “rocket science” and many people want to drive less, commitment from the top is required because change does not happen by chance. Speaker Tom Biesiadny, Director of FCDOT, detailed ways that his department is working to further bicycle transportation, such as completing the county bicycle master plan, partnering with VDOT to add wide shoulders or bike lanes during road repaving projects, and conducting a trails and sidewalk condition assessment. As the day progressed, speaker after speaker detailed ways we can bring better and safer conditions to cyclists. The more people who ride, the safer everyone is. Ideas were wide ranging: bike stations for residential tenants in redeveloped Tysons Corner, road diets that incorporate bike lanes, kids telling their peers how much they enjoy biking to school, bike sharing, enticing recreational bikers to try riding for short trips around town, convincing people that riding 2 miles to the store doesn’t mean you need to be an endurance athlete. Closing speaker Stewart Schwartz of Coalition for Smarter Growth pointed out that bicycling makes sense in terms of energy, economics, health, and competitive growth, and biking for transportation truly contributes to our national security. FABB presented awards to Fairfax County Bicycle Coordinator Charlie Strunk and VDOT Traffic Engineer Randy Dittberner for their work on behalf of bicyclists; both are avid transportation cyclists. We already are tossing around ideas for our next bicycle summit, although topping this year’s program will be tough. If you missed the inaugural event, be sure to attend the next one! Toole Design Group delivered the final draft of the Fairfax Countywide Bicycle Master Plan County Bike Coordinator Charlie Strunk. Staff briefed the Planning Commission on the bike plan on October 17. Meetings are currently being scheduled with staff from the Department of Planning and Zoning and the Department of Transportation's Long Range Planning Section in order to review format and comprehensive plan language compatibility. The draft-final plan will be presented to the Planning Commission after the first of the year to seek approval of the Plan. It will then go to the County Board of Supervisors for their approval. Once a copy of the Plan is available we will post information on the FABB website. Over the past 3 years, FABB has been working with both Fairfax County government and the Fairfax County Public Schools, encouraging them to embrace a system-wide effort to get more children to walk and bike to school. Leveraging the National Safe Routes to School (SRTS) program, Jeff Anderson has been leading the charge for FABB and recently brought national exposure to Fairfax. In May, WAMU's Metro Connection interviewed Jeff and two of his three children for the feature From A To B: Families Try To Bring Back Walking, Biking To School, which ran on NPR. In June, Nike sent a photographer to capture the Wolftrap ES Bike Train as part of a larger report, Designed to Move: A Physical Activity Action Agenda. The SRTS section of the report (page 78) contains a photo of Wolfie's bike train. Bicycling magazine published a report on biking to school and included a picture of the Anderson peloton as representative of kids who can and do bike to school (section 7). In August, Wolfie's Bike Train was featured in the article Uphill Ride: Kids and Their Parents Show the Way to Cycle Safely to School in Landscape Architecture magazine. Finally, in September, Nickelodeon sent two film crews to Wolftrap ES to film the bike train and to profile Carina Anderson (6th grader at Wolftrap ES) as part of their 30 min special on I Play Because... The kids at Wolftrap ES are setting a great example for others. FABB will continue to push for continued movement within Fairfax County to get more kids to bike and walk to school as these children are the bike commuters of tomorrow. Delegate Alfonso Lopez (49th District) plans to reintroduce the "Exercise due care" and "Following too closely" bills again in the 2013 session. Both bills would help educate motorists about the rights of bicyclists and the need for motorists to drive carefully around them. These bills were opposed last year by Northern Virginia Delegate Barbara Comstock (34th District), who cast deciding votes in defeating them. Once the and other bike-related bills are introduced we will ask cyclists to contact their local legislators to urge them to support the bills. 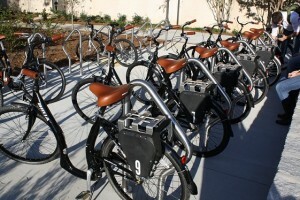 GMU recently implemented a bike sharing system at four "stations" around campus. One-time $3 fee to check out a bike for a 12 hour time period. Fairfax County DOT recently hired a new bicycle (and pedestrian) staff person to work in the county bike program. Her name is Vanessa Aguayo. According to the county bike coordinator, "She has an engineering background, comes to us from the private sector, and has lots of experience in designing bike and pedestrian projects as well as traffic calming." Welcome to Vanessa; we look forward to working with her. VDOT recently released an updated version of the state bike map, Bicycling in Virginia. The map shows major bike routes in the Commonwealth, including United States Bicycle Routes (USBR) 1 & 76, Skyline Drive, Blue Ridge Parkway, the Virginia Capital Trail, and a few other major trails. There is a Northern Virginia inset showing details of USBR 1, the Fairfax Co Parkway Trail, the Cross County Trail and others. The 495 Express Lanes are scheduled to open on November 17 . Since 2007 a major goal of FABB has been to ensure that bike facilities are included on the bridges across the Beltway. Most Beltway bridges between I-95 and the American Legion Bridge were reconstructed as part of the HOT lanes project (now called the 495 Express Lanes). See the many blog postings on our HOT lanes advocacy. We attended public meetings, wrote a Post Outlook section article, and met with county and VDOT staff to ask that the facilities that are indicated on the county Trails Plan be included in the project. With support from Fairfax County DOT and VDOT, those facilities are a reality. While they are far from perfect, in most cases they provide the first accommodations for pedestrians and cyclists on the Beltway bridges. The next step is to ensure that those new facilities are connected to the surrounding bicycle route network. FABB Fact: 31% of trips in central Fairfax are less than 3 miles. Events - For full details see the FABB Events Page. 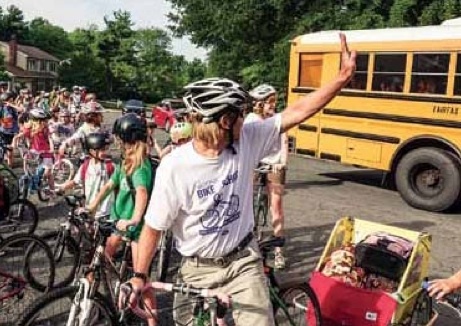 Fairfax Advocates for Better Bicycling is a grassroots initiative, affiliated with the Washington Area Bicyclist Association, aiming to make bicycling an integral part of Fairfax County's transportation network. Visit us on the web, Facebook, and Twitter. Donations to FABB are tax-deductible and help us further our bicycling goals in Fairfax. 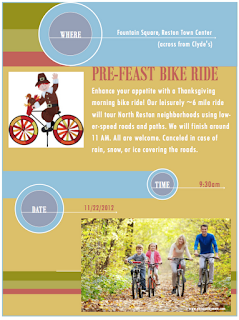 Reston Association is hosting a Pre-Feast Bike Ride on Thanksgiving Day ride starting at Fountain Square at Reston Town Center. Along with the FABB Reston Social Ride on Saturday Nov. 17, there are two opportunities to check out the streets of Reston in November. Both rides will be casual, slow-paced rides. The Reston Association ride is approximately 6 miles and the FABB ride is just over 14 miles with an optional 10 mile shorter ride. Registration is required for the FABB ride. Everyone is welcome at the Pre-Feast Bike Ride. Let's hope for good weather for both events. There are no rain/snow dates; both rides will be cancelled if there is rain, snow, or ice covering the roads. Join FABB for a Social Ride in Reston. It will be a casual tour of various sights in the Reston area on Saturday, November 17 at 9am. The tour will start at the Reston Town Center Pavilion. Sights include bike lanes on Lawyers Road and Soapstone Drive, Walker Nature Center, Weihle Ave Metro Station, Bowman House, historic Lake Anne, and Browns Chapel. We will ride at a slow pace as a group. The tour is just over 14 miles with a shorter option of approximately 10 miles. Free online registration is required. All riders must be WABA members, wear a helmet, and sign the ride waiver. There is no rain date. We attended part of the first scheduled hearing on October 15 and it was a learning experience. We learned that even the most blatant traffic offenders are often treated lightly. Those who pleaded guilty were often given relatively light penalties. In at least two cases the judge stated that he was lowering the speed of the offense which would "help you out with the DMV." Only the worst of the worst offenders every make it to court, and yet it seemed that the judge was treating their offenses very lightly. Police almost never write speeding tickets unless motorists are driving at least 10 mph over the speed limit and yet those motorists were only given a slap on the wrist. We plan to attend the court hearing on Monday morning and will report back on the outcome. Update: After a couple of hours of traffic citation cases, the judge called the name of the motorist who struck the cyclist. The motorist, John Thorpe, appeared with his attorney. Unfortunately the cyclist wasn't there. Notice of the hearing was sent to the wrong address and the prosecutor was not able to contact him by phone. Three witnesses were also present. The judge agreed to one more postponement, to Monday, January 7 at 9:30am in Vienna. HERE’S AN IDEA for motorists who complain about having to pay the fines assessed by the District’s traffic cameras: Obey the laws. Driving the speed limit, stopping at red lights and not making prohibited right turns on red are the best defense against getting a ticket. More important, compliance with traffic laws—something indisputably boosted by these much-maligned cameras—enhances safety. Only bicycles seemed to be rolling. The storm damage had a synergy of its own. Efforts to pump floodwaters from subway and automobile tunnels were slowed by electrical shortages. Hastily arranged car pools became bogged down on highways and city streets clogged with other commuters. Many gas stations, without power to operate their pumps, could not open for business, eerily evoking the fuel crisis of the 1970s.